As I've mentioned before, I sometimes just pull random books off of the shelf if the cover tickles my fancy. 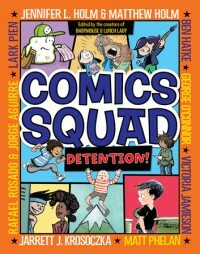 That's precisely how I ended up reading Comics Squad #3: Detention by Jennifer L. Holm & Matthew Holm, Jarrett J. Krosoczka, Matt Phelan, Victoria Jamieson, Ben Hatke, Rafael Rosario & Jorge Aguirre, and George O'Connor. (Please excuse me while I take a nap after copying down all of those authors.) As you might have guessed, this is a collection of comics by different authors all centering on the theme of detention. I'm obviously not the right audience for this because 1. I'm too old to get detention and 2. Even when I was old enough for it I never got detention. So while I didn't feel as overwhelmingly into this collection as a typical middle grader I still enjoyed it overall. That being said, there were some that stood out more than others and when I looked back through them I realized they were all by the same artist: Matt Phelan. I immediately added his works to my TRL (look out for that post in the near future). If you're interested in trying out a wide variety of illustrative styles and author's voices then this is a really great way to do that. It's definitely a mixed bag so you'll come away with hopefully at least one author/illustrator that you'll want to check out further. It was a light, fast read that served as somewhat of a palate cleanser after some of the denser books that I read previously. It's a 6/10 for me but I wouldn't say no to more books in this series (which do indeed exist if you didn't guess by #3 in the title).